Oxidative roasting-ammonia leaching is the most popular method to extract Mo from molybdenite concentrates. However, the pyrometallurgical process has long suffered from the exhaust gas treatment for acid-making using low-concentration SO2. Technically, gas circulation can work as an effective means to enrich SO2 in exhaust gas and meantime to reduce overall emissions. However, with SO2-enriched atmosphere, roasting behaviours of the components in concentrates would be changed, thereby influencing the recovery of Mo. 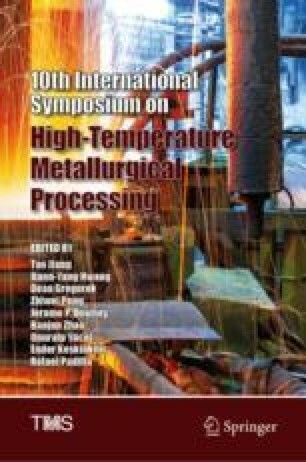 In this study, both thermodynamic and experimental studies were carried out to explore the thermal transformations of main components in molybdenite concentrates under SO2-containing atmosphere. Thermal behaviours including oxidation of sulphides and formation of molybdates and sulphates were discussed. It was found that SO2 has a minor effect on sulphides oxidation, and raising the temperature and proportion of SO2 and O2 are effective means to extract the associated Mo from molybdates, which demonstrate the potential of applying exhaust gas circulation (EGC) technology in oxidative roasting of molybdenite concentrates. This work was supported by the National Natural Science Foundation of China (No. 51874355) and the Co-Innovation Center for Clean and Efficient Utilization of Strategic Metal Mineral Resources.